For those discerning hunters that want to stay as far away from the canned hunt as possible New Zealand has hunting opportunities that are unrivaled in most destinations around the world. The Kiwi Classic Hunt is a hunt that offers the extreme reward of hunting in the incredibly challenging environment of the Southern Alps of New Zealand. about our Kiwi Classic Hunt - Free Range Red Stag and Himalayan Bull Tahr package. This is a hut (cabin) based hunt on PUBLIC land. The huts are basic, without running water or electricity but very comfortable and more importantly right in the middle of the prime hunting area. Read more about and see photos of the public hunting huts. The benefits of hunting on public land is that there are NO trophy fees associated with this Kiwi Classic Hunt so if you are looking at doing it the hard way, the local way, then this is a really great experience with an opportunity to take multiple animals for one low up front package cost but only those with the highest level of fitness will be able to take advantage of an experience like this. 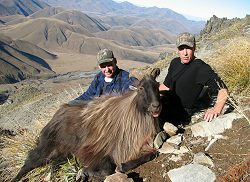 The target species available for the Kiwi Classic Hunt will be Himalayan Tahr, Chamois, Red Stag, Fallow Deer, Wild Boar and South Pacific Goats. In addition to the Trophy animals you will also be able to participate in complimentary small game hunts as well for Wallabies, Possums, Rabbits and Hares. You get an opportunity to decide the order in which you can go after your quarry and then start your hunt. Your entire stay will not be in a hut environment, but rather as you transfer in between hunting areas, there will be a few nights that your accommodations will be at a local bed and breakfast, where you can get a hot shower and charge up the batteries on your camera. See our photo gallery for the Kiwi Classic Hunt. Our guides for the Kiwi Classic Hunts spend all year long in this environment harvesting the game that you are after, so it is with great pleasure that they have an opportunity to share with you how the Kiwis do it. Free Range Fair chase and with no trophy tag or license fees! If you are looking for a hunt within New Zealand's target rich environment of the Southern Alps then this is the hunt for you! Download our flyer for the Kiwi Classic hunting package. All of our packages include round-trip airfare from Los Angeles by default, however, any of our packages can be customized for business/first class air, no air tickets, or tickets from other cities. When comparing our packages to those of other providers, be sure to check to see if theirs includes air. Sunspots' 30+ years as a travel wholesaler brings us incredible advantages when it comes to airfare prices to New Zealand! Learn more about traveling to New Zealand.